Capitol Reef National Park is such a stunning place to visit and explore. There are so many different types of scenery here it’s absolutely breathtaking. Capitol Reef is very popular for backpacking as well, there is a lot of really exciting backcountry to explore here. 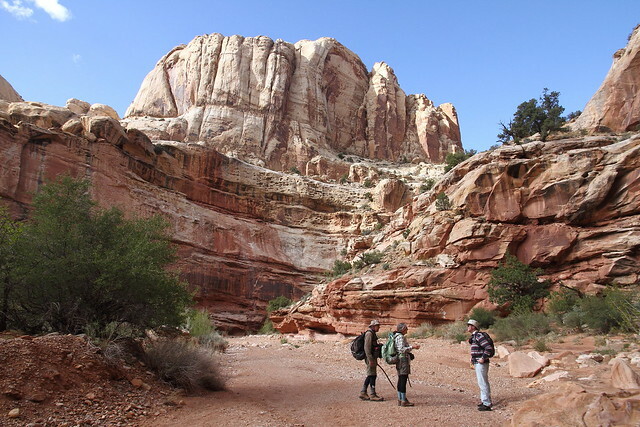 Here are some of the most popular backcountry backpacking areas in Capitol Reef. This is a pretty awesome backpacking venture, that round trip will take about 3-4 days to complete. It explores the southern end of the park which is more desolate, and largely unmarked. You will most likely need to carry a topographical map since it is an unmarked area. There are plenty of side canyons that connect with Halls Creek to explore as well. The canyon walls are works of art that tower high and seem to consume you as you travel deeper into the narrows. This is such an awesome hike and one that any thrill seeking backpacker will enjoy. This is a natural year round stream that has cut a deep canyon. This is an unmarked area and can be very dangerous due to flash flooding and falling rocks, but if you go the right time of year you should be okay. There are footpaths that are unmarked, and the park asks that you stay on these paths and try not to step on the soil crusts that prevent erosion of soft, sandy soils. This can be a day trip, or you can camp here, backcountry permits are required for overnight stays. This is a very narrow and “twisty” canyon. Quite possibly one of the coolest looking canyons in Capitol Reef Park. This canyon was once used as a pathway for the wagons to get to San Juan county for the mormons. They considered it to be narrow enough to “twist a mule” hence he name. A topographical map is suggest for this hiking area as it is unmarked and very easy to get lost in the canyons. This is a very hot hike and the water resources do not always work, so be sure to bring a sufficient amount of water. This canyon is really awesome! A creek has cut the canyon deep through some of Capitol Reefs oldest exposed rocks. This hike consists about two miles of scenic and beautiful narrows and three waterfalls. This is a dangerous flash flood zone, so make sure you have checked the weather before heading into the hike. This is not an official maintained trail, so there could be route changes due to rockfall and flooding. There are many more backcountry places to hike in Capitol Reef, these are just a few of the favored hikes. Make sure to always put safety first and talk with park rangers before heading out into the backcountry.